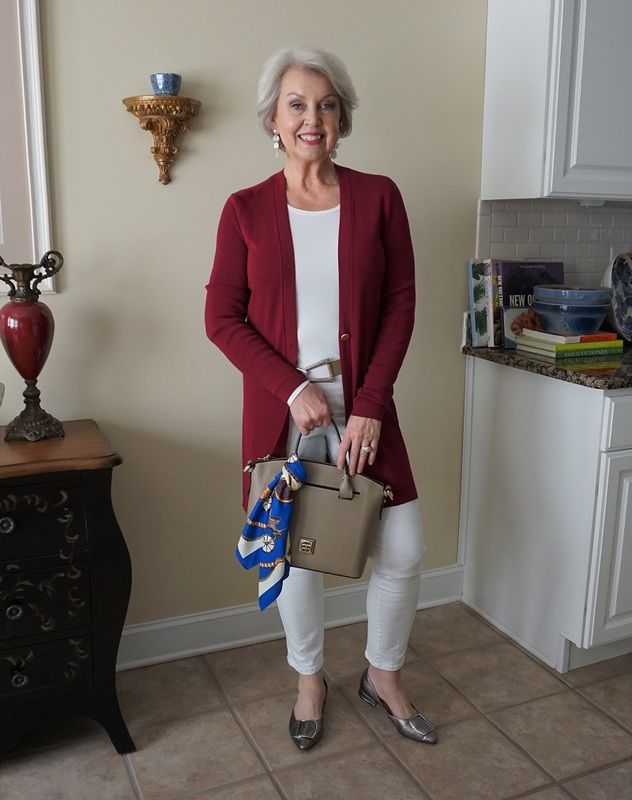 A wardrobe that includes neutral solid color pieces allows me to build a variety of outfits. I can change my look and the attitude of the clothing with different accessories and shoes. The Mulberry Red cardigan is from Chico’s here. The belt was also from Chico’s a few years ago. 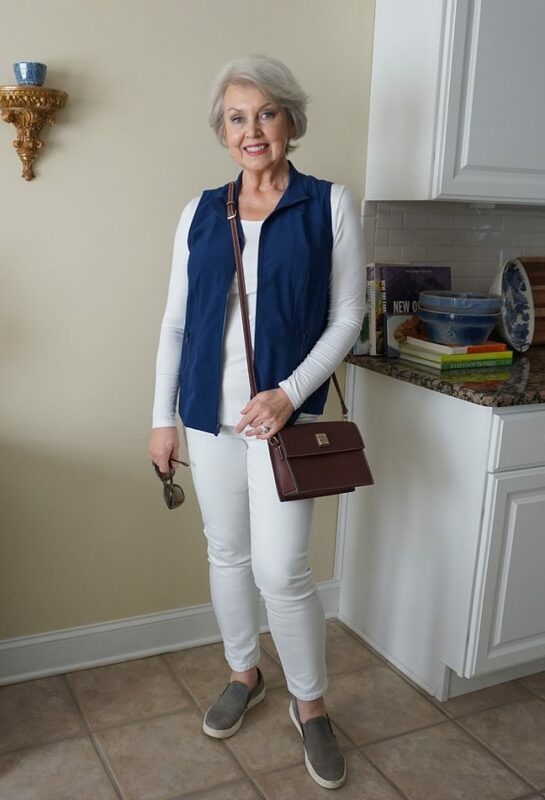 The light taupe bag is from Dooney & Bourke here. The pewter flats are by Franco Sarto from last year. Similar current flats here. The fun silver and white earrings were from Stein Mart. Similar earrings are here. Referral and affiliate links in my posts may generate a small commission for Susan After 60 Inc. at no cost to you. The small silk scarf sold out, but other styles are here on my shopping site, where you receive a gift with every purchase, even if you buy a sale item. Base-garments are most useful worn in combination with accessories, jackets, cardigans or vests. The various possibilities allow you to create numerous looks from a smaller wardrobe. The blue vest was from Chico’s, but it has sold out now. A similar vest for summer is here. The Dooney & Bourke crossbody bag in Bordeaux is here. Similar slip-on sneakers are here. (Mine are a couple of years old.) Similar silver hoop earrings are here. Base-garments include close fitting solid pieces that add no bulk when you layer over them. You might not ever wear them alone, but they are integral to building successful outfits. If you start with loose fitting or bulky items, it can make you look sloppy and much more substantial than you are as you add items over them. Make sure your base-clothing items fit close to the body and that they include thin material. Use the same color on the top and bottom to create a long, lean column. 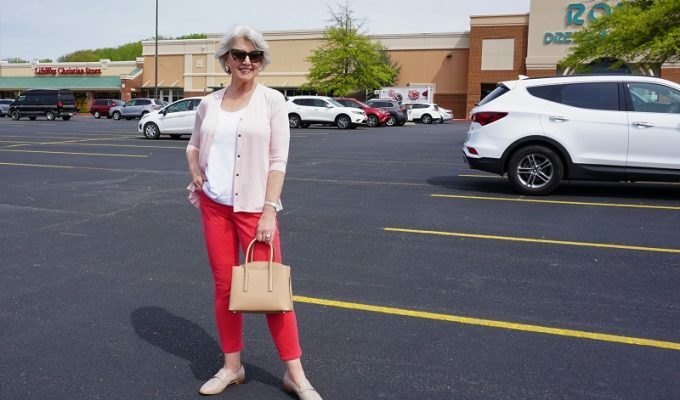 The Nine West bag is from T.J.Maxx, but I also found it here. The black suede heels are several years old. A pair I would purchase now is here. A similar dome ring is here. A similar square set stone ring is here. Similar drop earrings are here. My favorite makeup and skin care line is Beautycounter here. I always look for the items that appear to be fine jewelry versions. My collection includes only faux stones set in sterling silver. The best style is the one that flatters your shape, fits your lifestyle and helps you feel confident. Have a beautiful day! Hi Susan—great ideas. Is your mulberry cardigan available? It doesn’t seem to be the same cardigan. 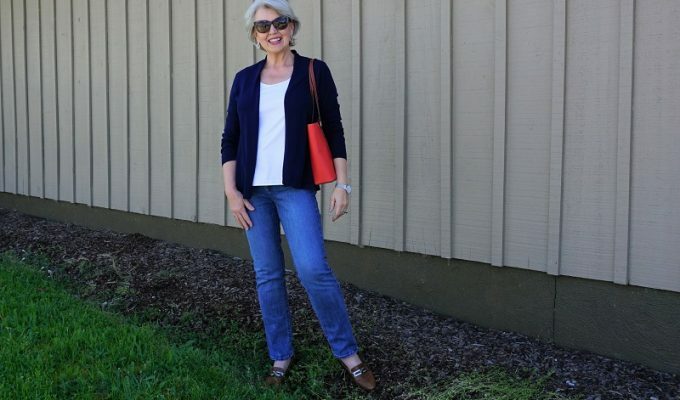 The link takes you to a draped cardigan with a hood which adds extra bulk. I don’t see the hood on your cardigan. Thanks for pointing that out. I had grabbed the wrong sweater. The one I am wearing is this one. I found your site about 5 months ago and it was the best thing! I hope you know how inspiring your videos are.! Your tips are spot on as I am also a classic dresser except I hate to shop but always want to look pulled together! It seems now that I am retired I really lost interest in shopping and you have helped me to realize there is no need to feel that way. I love your candidness about body shape and the ageing process as sometimes one thinks they are the only ones this is happening to. Thank you so much for this valuable information and keep these videos coming! I’m so happy that what I share has been helpful to you. Thank you for your comment. Thank you so much for showing how a plain, solid base can be changed up so easily! Your videos and photos make it seem less daunting to try ourselves. I love this post. This is how I try to dress. You do it beautifully and are such an inspiration. Thank you. It is helpful for you to post those pictures with just the accessories. This seems so easy, but it’s challenging not to get distracted by all the options in the marketplace. I bought the white, navy and black Covered Perfectly tops a few weeks ago. WHY I did not return them I can’t explain because they are WAY too long on me and if I want to wear them I’m going to have to take them to alterations to have them shortened by at least 4”. I’m only 5’3’ and expected them to be a little bit long but NOT down to my knees practically!! The ones you wear always look so good on you and at a normal length. Just wondering….do you have to have yours altered??? I’m very frustrated over this and disappointed because that’s simply going to add to the cost of the tops. I don’t want to wear them all gathered up around my waist….I have enough bulk in that area! Ha!! Love your blog and you always have such good advice. I’m a ‘classic’ too so your style is very much my own except I DO love more color. Look forward to all of your posts! I am 5’6″, but I haven’t had any of the tops altered. I wear them all the time, and they have been great bases for me. Just a help to your petite readers that might be interested in the Covered Perfectly tops–the size chart shows they start at 26 inch length with size small and go up to 32 inch length with a 2X. Also, the link to the Liverpool jeans is for skinny jeans with a 10 inch leg opening. They are called denim leggings in the product description. Thank you. I’ve updated the choice for the white jeans. This style is more like mine from last year. Wow a 9 inch leg opening in the super skinny pants in your new link. How do you do it? No! That still isn’t right. My jeans are always straight leg with about a 12-inch opening. Try the Meredith. It didn’t show up in my search this week. I love how you looked in that merlot color. So pretty on you! One of my favorites on you. I love this video! I know logically about building a base wardrobe and have watched you for years but seeing it is always helpful. I still can’t believe all the different looks you got! Seeing is believing. I definitely shop my wardrobe differently now, and even bought a belt! Thank you! And I loved the tip about earring color vs.clothing/bag hardware color. Thanks again! Susan, do you wear white pants all winter? I have often wondered this. Also when you say you find something “here” and you click on here and it takes you to API.shopstyle.com, it never seems to go there. Any idea why? Keep sending pics and blogging. I am learning alot. I do wear white jeans on any sunny day. It may take a few seconds, but the ShopStyle links should take you to an online spot where you can buy something similar if you want. Susan, it’s been such fun following you as your style has evolved. Two questions, if I may. My wedding ring is gold, but I love wearing silver. Not sure I like gold/silver combo. And, due to surgery, I have a stomach problem which shows dreadfully. Almost all tops now contain some sort of stretch fabric. I’m really having trouble finding fabrics that don’t call attention to my problem. Have thought about maternity products, but think probably they’d be too large everywhere else. Your thoughts would be appreciated. I have been mixing metals all my life. (Even as a jewelry designer.) I look best with silver hardware, but most bags, shoes, and belts come with gold. I do have several friends who wear maternity jeans and tops for the same reasons you mentioned. Maternity styles have come a long way. Won’t hurt to try some on and see how you like them. Love all the suggestions in this video! My style is very similar, so your outfits are perfect suggestions for me. I’m not as slim as you are and I’m shorter at 5’3″, but I can make most of your suggestions work. Thanks again! Thank you for this post, Susan! I was thinking about what I would wear to an artist guild afternoon celebration, and with your help I have it! I will wear a white top, black dress slacks and a denim jacket with my vintage American Indian jewelry, snakeskin dress shoes and Brahmin bag. I know I will look appropriate and effortless for this function. Thanks again for all your helpful tips! Susan, you must have needed a nap after that one! Another post that was worthy of note-taking. It reminds me of my university days but without the boring lectures and exams! Very nice looks and a helpful video! I have been over spending lately and I keep needing to be reminded that I can create so many outfits with what I already have. Thank you Susan for all your tips and tricks. I have been binge watching your you-tube videos and have learned a great deal from you. I think you look great in your flats. I am in my mid 50’s and feel like I have to work extra hard to not look frumpy because I am overweight. What are the best type of flats to still look stylish and attractive? I find that pointed or almond-shaped toes and a visible arch always look more polished. The video was very helpful. Thank you for sharing it. Love this! Your looks are different enough so that no one would guess you are wearing the same pants and top. I always learn something I can use right away…..
Really enjoyed seeing you go from the basics & change your look 3 ways. Thanks for the video! Thank you, again, Susan. This post and video was so helpful! I tried it today and it was so quick and easy to get dressed to go out. 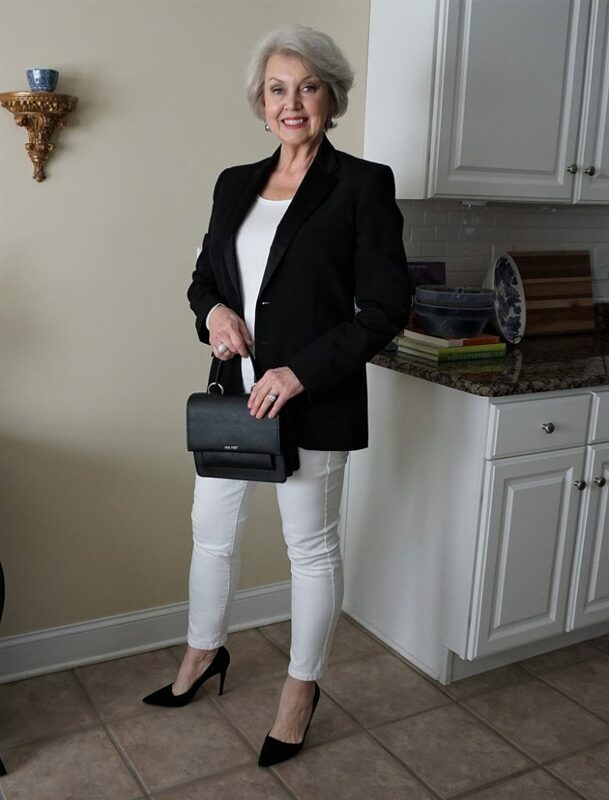 I grabbed a close fitting black top, black knit pants, put on a casual waffled blazer in a teal blue, and draped one of your mixed aqua blues and white scarf around my neck, pulled on a pair of pointed toed black leather booties, and a grey tote handbag. It was a cute outfit. I couldn’t believe the compliments I received today. One person told me how nice I looked and then came back later and said, “I think it’s the teal blue that brings out the blue in your eyes. You just look so extra nice today.” Had to think a minute what she was talking about. Ha ha . Had to tell you because it came together all because of this post. It made me feel good. Thank you! Your comment makes me very happy! I love your hair in these pictures, your best style yet. Hi Just wondering what fabric your vest is made from? Click on the link to read more about each product from the company that offers it. The best is polyester, spandex. I love your easy to manage wardrobe. You always look so pulled together! The Spring update shows some lovely tops from Clara SunWoo, if you don’t mind could you tell me the size you are wearing? I’m 5’3” and a 34DDD weight around 135. I’m petite, so I am concerned about ordering since nothing is showing petite in size. I prefer not to make returns on clothing and thought your sizing could help in me choosing my size. Also, the undergarment you are wearing in the build a base video looks like it could be hot under clothing…is it? The white tee looks comfy on! One last question…. since I’m larger busted and you seem to be as well, I thought only wearing V-neck tees was my only option….but I see you wear a rounded neckline a lot of the time…. Thoughts please on all of the above would be appreciated! Thanks so much for all the styling tips! I wear a size medium top most of the time. I never notice the Shapeez bras. The company also makes an equally comfortable Tankee Short for sweltering weather. Your neckline should be flattering to your face shape. I do not look good in a high round neck, a turtle neck or a sizeable rounded collar. A V-neck is flattering over a larger bust because it breaks up space across the upper chest making it seem less expansive. When I wear a low crew or rounded neckline to keep warm, I try to break the lines up with a long necklace or scarf worn loosely. Love your ideas! Susan, your ring is beautiful and looks expensive. Please be careful about posting things like that! Guess I’m overly cautious. Love this teaching video: These are the how-tos that we need. Love your videos! Thank you Susan. Do you have a source for the same or similar lined black blazer? I did find a size medium one here and another here. Hi Susan! Great video and I’m learning how to mix and match and put together outfits with a good base. I do tend to buy something that I then regret and can’t find anything to go with it! Here’s one more issue I have – I am 62 and I still run HOT from menopause. It’s so annoying because I love jackets, sweaters and scarves. But I have not been able to wear a sweater in 10 years plus. Maybe if I was standing outside for several hours, but from home-to car-to work (where the heat is unbearable), I just can’t. Is it possible to look stylish and put together without layering?? Yes indeed! Watch me as I dress for the summer heat. I wear pieces that end in the “right” place on my body (that is not my widest part), and I always add a bold accessory to complete each look. A necklace, or bold earrings and a stack of bracelets or one bold chain bracelet will do the trick (never all three at once!). Use color wisely to conceal or draw the eye away from what you don’t want to feature.